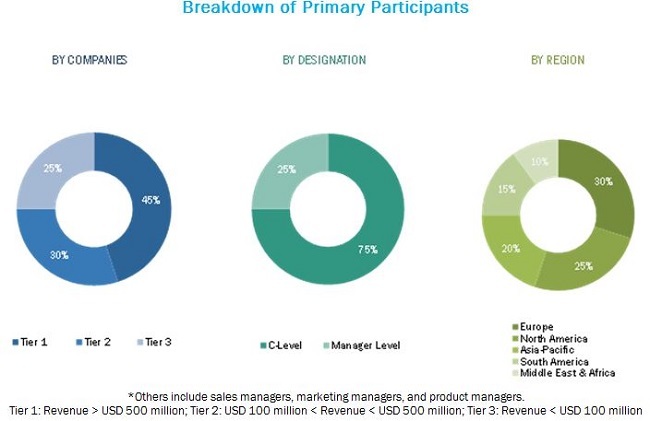 [209 Pages Report] The overall food service packaging market is expected to grow from USD 62.57billion in 2016 to USD 84.33 billion by 2021, at a CAGR of 5.23% from 2017 to 2022. Food service packaging is used to package processed and semi-processed food products. It caters to service sectors such as restaurants, fast-food joints, takeaway restaurants, and catering services. It helps in maintaining the hygiene, quality, and safety of food products. It provides heat resistance, prevents the growth of microorganisms, and helps extend the shelf-life of the food product. The base year considered for the study is 2016, and the forecast has been provided for the period between 2017 and 2022. There has been a gradual shift in consumer choice from traditional methods of preparing food at home to buying packaged products. Food service packaging mediums require less resources and energy as they are manufactured with recycled material; hence, packaged and disposable packs are available at low cost and importantly, occupy 35% less retail shelf space, making it cost-effective. It also offers a perfect alternative for display by creating more options for eye-catching graphics, ultimately increasing the marketability of the product. The food service packaging market has a positive outlook due to high growth in the food industry and the beverages sector. It is easy to open food service packaging packs as they are available in the form of both rigid as well as flexible, which makes it convenient for handling the product. Due to busy lifestyles, the demand for convenient products has increased, which has led to a rise in the demand for flexible and rigid packs. Due to this, transport and shipping costs are cheaper for food service packaging. Furthermore, it reduces fuel consumption in terms of transportation. During this research study, major players operating in the food service packaging market in various regions have been identified, and their offerings, regional presence, and distribution channels have been analyzed through in-depth discussions. Top-down and bottom-up approaches have been used to determine the overall market size. Sizes of the other individual markets have been estimated using the percentage splits obtained through secondary sources such as Hoovers, Bloomberg BusinessWeek, and Factiva, along with primary respondents. The entire procedure includes the study of the annual and financial reports of the top market players and extensive interviews with industry experts such as CEOs, VPs, directors, and marketing executives for key insights (both qualitative and quantitative) pertaining to the market. The figure below shows the breakdown of the primaries on the basis of the company type, designation, and region considered during the research study. 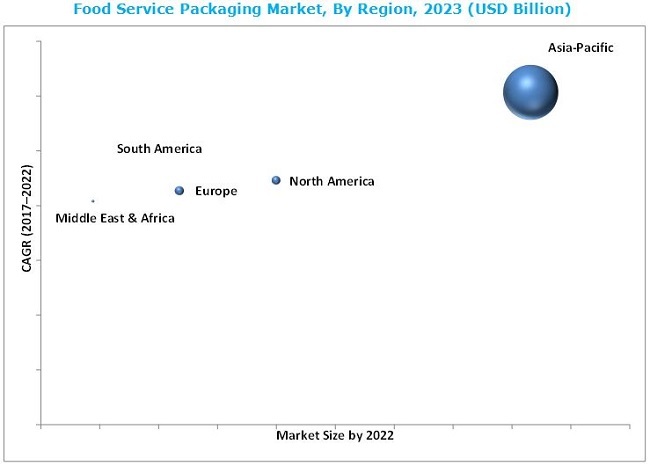 The food service packaging market comprises a network of players involved in the research and product development; raw material supply; component manufacturing; distribution and sale; and post-sales services. Key players considered in the analysis of the food service packaging market are as Amcor Limited (Australia), The Dow Chemical Company (U.S.), Bemis Company, Inc (U.S.), Westrock Company (U.S.), Sealed Air Corporation (U.S.), International Paper Company (U.S.), Reynolds Group Holding Limited (New Zealand), DS Smith Plc (U.K), Huhtamaki Oyj (Finland) Berry Plastic Corporation (U.S.), Ball Corporation (U.S.), Genpak, LLC (U.S.), Dart Product Europe Limited (U.K), Anchor Packaging Inc. (U.S.), Vegware (U.K), Sabert Corporation (U.S.), Union packaging (U.S.), Fabri-Kal (U.S.), Excellent Packaging & Supply (U.S.), BSI Biodegradable Solution (Canada), ISAP Packaging SPA (Italy), Landon Bio Packaging (U.K),Hefei Hengxin Environmental Science & Technology Co., Ltd (China),King Yuan Fu Packaging Co., Ltd. (Taiwan) Bionatic GMBH & Co.Kg (Germany). In June 2016, Ball Corporation acquired Rexam PLC (U.K.), a producer of beverage cans. The acquisition transaction was approximately worth USD 6.1 billion. The acquisition helped Ball become the largest manufacturer of beverage cans in Europe. In July 2015, Amcor acquired Packaging India Private Limited (PIPL) (India) for approximately USD 40 million. It had four flexible packaging plants in West and North India. The acquisition of PIPL expanded Amcor’s business horizon in India and increased the product portfolio. What are new application areas which the food service packaging are exploring? The overall food service packaging market is expected to grow from USD 65.36 billion in 2017 to USD 84.33 billion by 2022 at a CAGR of 5.23%. Packaging trends evolve in accordance with consumer demand, and consequently, with production and storage needs. The change in consumer demand patterns is the most influencing factor transforming the packaging industry. The growing demand for ready-to-eat food and the popularity of using convenient packaging are driving the demand for food service packaging. Food service packaging is used to package processed and semi-processed food products. It caters to service sectors such as restaurants, fast-food joints, takeaway restaurants, and catering services. It helps in maintaining the hygiene, quality, and safety of food products. It provides heat resistance, prevents the growth of microorganisms, and helps extend the shelf-life of the food product. The food service packaging market has been segmented, on the basis of packaging type, into flexible packaging, paper & paperboard packaging, rigid packaging and others. The market for flexible packaging is expected to grow at the highest CAGR between 2017 and 2022. The increasing demand for sustainable packaging has propelled the market for flexible packaging in the food service packaging industry. The food service packaging market in Asia Pacific is expected to grow at the highest CAGR during the forecast period. Asia-Pacific is projected to grow faster than any other region-level market, as it is the most widely populated region in the world, countries such as India and China are expected to witness high growth in the food service packaging market due to the growing developmental activities and rapid economic expansion. In addition to this, the growing population in these countries present a large customer base for fast moving consumer goods (FMCG) products and consumer durables, which in turn is expected to lead to the growth of the food service packaging market. Beverages include various types of drinks, based on their constituents and their compositions. There are various types of beverages such as alcoholic and non-alcoholic. Global players are aiming at using innovative packaging materials, developed from degradable and recyclable materials to achieve sustainability. The expectations for quality & hygiene and growth in health awareness are driving the food service packaging market growth in the beverages sector. With the increasingly busy work schedules of people, there has been a rise in the demand for ready-to-cook vegetables, including microwave meals. The most consumed canned vegetables include tinned tomatoes, peas, baked beans, and mushrooms. Also, the packaging of fruits has gained importance in the global food packaging market. Food service packing helps in preserving the nutritional value of fruits, while providing an extended shelf-life. The most consumed canned fruits include pineapples, blackberries, cherries, and grapes. The bakery & confectionery category includes chocolates, chewing gums, and other related items, such as cereals, breads, pizzas, and biscuits. The major players in this category, such as The Kraft Heinz Company (U.S.) and Nestle S.A. (Switzerland), are concerned about the packaging of these products, as the products get spoiled due to oxidation. Packaging has an important application in this product category as it also helps in flavor retention, texture maintenance, and maintenance of product appearance, while inhibiting rancidity and microbial growth. The growing consumer base for branded confectioneries in developing nations, such as India and China, has fueled the market for packaging technologies in the bakery & confectionery industry. Dairy products are the most perishable food products. This category includes butter, cheese, curd, and yogurt; most of these products get easily spoiled if they are not packaged efficiently. The various kinds of packages of dairy products include pouches, sachets, barrels, cups, cans, and bottles. Consumers with busy lifestyles want the packaging to be both convenient and protective. Freshness, natural taste, and visual appeal with an extended shelf-life are the factors driving the market for dairy product packaging. The demand for dairy products has been on the rise due to the rapidly increasing population in developing nations as well. Stringent rules & regulations is the major factor restraining the growth of food service packaging market. Stringent regulations imposed for food service packaging may pose as a restraint but to a lower extent for the market. Compliance with regulations is necessary as the smallest defect in the packaging may contaminate the product. It will also negatively impact the manufacturer’s profit. Packaging for food & beverages, personal care, and healthcare requires control on moisture, light barriers, and ease of transport. Regulatory authorities ensure that the raw materials used are recyclable, such as plastic, paper & paperboard, and cellulose. The packaging industry needs to make packaging sustainable and at low costs. Using raw materials that are biodegradable costs higher than their non-biodegradable counterparts. This adds to the production costs, which further increases the cost pressure, thereby limiting the growth of the food service packaging market. Key players in the market include as Amcor Limited (Australia), The Dow Chemical Company (U.S.), Bemis Company, Inc (U.S.), Westrock Company (U.S.), Sealed Air Corporation (U.S.), International Paper Company (U.S.), Reynolds Group Holding Limited (New Zealand), DS Smith Plc (U.K), Huhtamaki Oyj (Finland) Berry Plastic Corporation (U.S.), Ball Corporation (U.S.), Genpak, LLC (U.S.), Dart Product Europe Limited (U.K), Anchor Packaging Inc. (U.S.), Vegware (U.K), Sabert Corporation (U.S.), Union packaging (U.S.), Fabri-Kal (U.S.), Excellent Packaging & Supply (U.S.), BSI Biodegradable Solution (Canada), ISAP Packaging SPA (Italy), Landon Bio Packaging (U.K),Hefei Hengxin Environmental Science & Technology Co., Ltd (China),King Yuan Fu Packaging Co., Ltd. (Taiwan) Bionatic GMBH & Co.Kg (Germany). These players are increasingly undertaking mergers and acquisitions, and product launches to develop and introduce new technologies and products in the market. 11.13.12 King Yuan Fu Packaging Co., Ltd.